And if that doesn't work, this is a direct link to the SPOT page. The White Mountains 100 race doesn't have GPS tracking, so this is just a personal page that doesn't indicate my position in the race. But the race volunteers do post regular updates to the Facebook page as well as the official race Web site. I'm excited to get started. I attended the pre-race meeting along with several people on the wait list who were hoping to nab a spot. Someone on the roster drove all the way up from Anchorage and showed up 15 minutes late, only to learn his spot had been given away to Jay Cable, who I believe is the last remaining person to have participated in all five years of the event (Myself and others have managed to make it into four; I rode in 2010, 2011, and 2012.) I'm not sure who lost their spot but word is they were pretty miffed, understandably. That's the cutthroat nature of popular endurance races. Getting in is the hard part. I set two alarms to ensure I don't sleep in, or I'll lose my spot as well. I enjoyed Thai dinner with a bunch of runners — the trio from Juneau, Joe Grant, and a few others. Some were under the impression that I was running the event as well; one even asked me about my sled. The concept has become so foreign to me at this point that I just stared blankly for a few seconds ... ("Sled? What sled? Oh, no, I have a bike.") Most of the runners are only carrying small packs anyway, as the White Mountains 100 does not have required gear. It should be a fast race for them as well. Weather looks like it will be partly cloudy with daytime temperatures in the high 20s to low 30s, and nighttime temperatures in the single digits, down to 10 below in low-lying areas. I packed all the clothing I think I'll want to wear on the bike if it gets down to 10 below, spare hat and gloves, repair stuff, a small med kit, microspikes for my boots (my black ice incident in Anchorage has me spooked about attempting to ride anything icy), two headlamps, spare batteries, camera, and about 3,000 calories of fruit snacks, peanut butter cups, and bagel chips. My food plan is to mostly nosh on this stuff and perhaps checkpoint cookies until Windy Gap at mile 62. The Cache Mountain baked potato always makes me feel icky going over the Divide, so I'm going to try to resist it (no promises). I have a good amount of experience on this course, plenty of endurance and a lot of enthusiasm. The only thing I'm missing is fast legs. But I hope to find the stamina and happy knee place to push as hard as I can tomorrow. Speaking of enthusiasm, I went out today for one last shakedown spin that turned into a 20-mile ride through the Goldstream Valley and up 1,200 feet on the Eldorado Creek trail. Beat, Liehann and I dragged our sleds for half that distance on this route back in December at -34 degrees, chasing the fading early afternoon sunlight up the ridge for a strenuous three-plus hours. 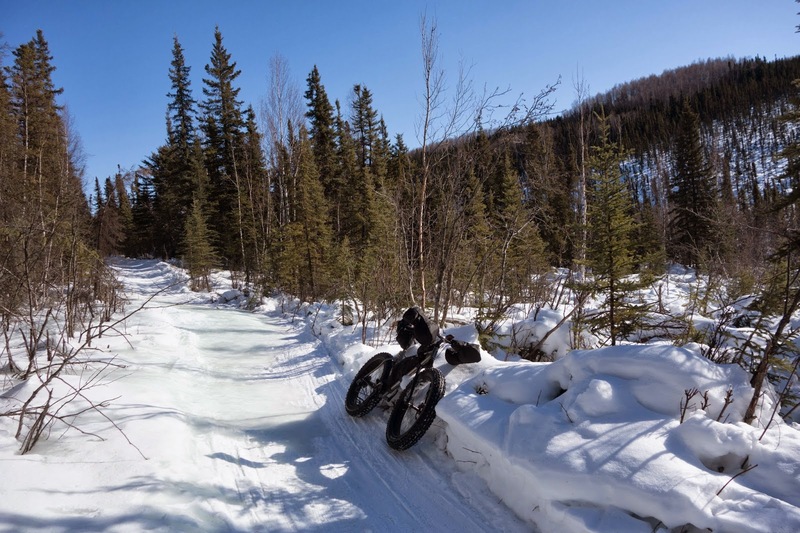 This ride was just about the polar opposite of that — warm, glaring sun, and absolutely flying (well, relatively flying) on a fat bike. With all of the happy slogging I've done this winter, the sheer efficiency of a bike still astounds me. I can't wait for the Whites! Congratulations on a successful ride. Were Brady and you racing at the end for 3rd F? Then again, to moi, anyone who enters an ultra race is a bona fide winner. Lost my post somehow. This may be a dupe. I'd say you "hanged" purrty good. I stumbled across your 2011 post which had you in at 17.9 hours and you finished this one in 11.6 hours. Ya cut 6 hours or bettered 2011 by what..35%. 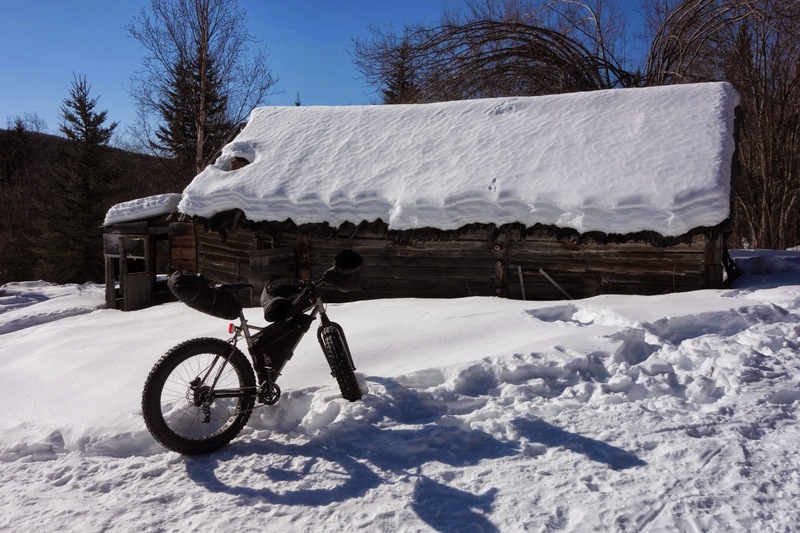 I am not a rider (like, at all), but this is one fat bike! :) Well, fat wheels, I guess. Nice work, Jill! By the time I checked to internets to see how you were doing, you were already done - bananas!